Does Your Rockville Storefront Need a Facelift? If you are a property owner, landlord, or tenant of a retail space located in Rockville, REDI has an exciting new incentive program for you. The Retail Facade Improvement Grant Program offers financial assistance for exterior facade/street front improvements to Rockville's retail buildings. Funded by the Maryland Department of Housing and Community Development through its Community Legacy Program, façade grant recipients will be eligible for a reimbursement of up to 50% of their project costs, capped at no more than $5,000 per property. Grant funds may be used to pay for cosmetic improvements such as lighting, paint, awnings, doors, windows, signs, ADA access ramps, landscaping, and other exterior projects. Online applications are accepted on a rolling basis until the application cycle ends on May 31, 2019. To qualify for the Retail Facade Improvement Grant Program, applicants must be a current owner, landlord, or tenant of a retail property located within the City of Rockville’s Sustainable Communities areas and submit the required documentation. Complete details can be found at https://bit.ly/2mRVXHM or RockvilleREDI.org. Make your retail storefront more attractive and inviting to your customers. 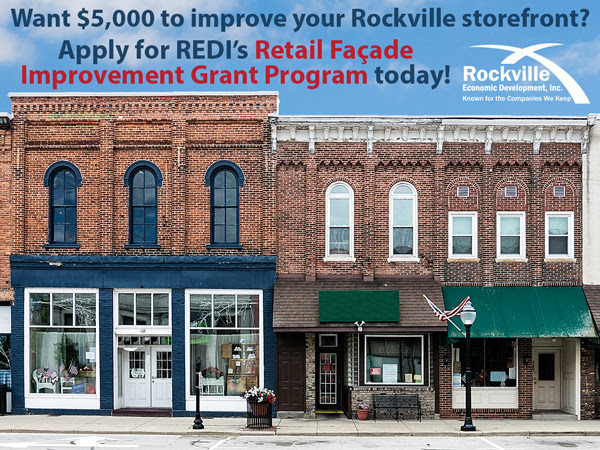 Apply for the REDI Retail Façade Improvement Grant Program today!